[[File:Camilla_Mayer-Hempel.jpg|Ruth Hempel (Camilla Mayer II (1948)|thumb, right|300px]]In 1934, [[Lotte Witte]] (1918-1940), a sixteen-year-old pretty brunette, joined Camilio's troupe. She was born in 1918 in Stettin, Germany (today Szczecin, in Poland), the daughter of a plumber. Fearless, attractive, and very talented, she soon became the troupe's main drawing card. Camilio fell for her, and he gave her as a "nom-de-scène" not only his family name, but also his first name: Lotte became known as [[Camilla Mayer]]. [[File:Camilla_Mayer-Hempel.jpg|thumb|right|300px]Ruth Hempel (Camilla Mayer II (1948)]]In 1934, [[Lotte Witte]] (1918-1940), a sixteen-year-old pretty brunette, joined Camilio's troupe. 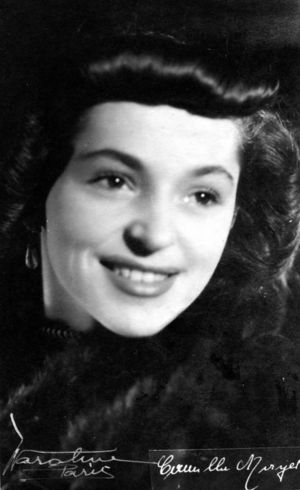 She was born in 1918 in Stettin, Germany (today Szczecin, in Poland), the daughter of a plumber. Fearless, attractive, and very talented, she soon became the troupe's main drawing card. 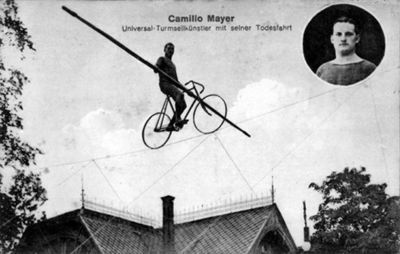 Camilio fell for her, and he gave her as a "nom-de-scène" not only his family name, but also his first name: Lotte became known as [[Camilla Mayer]].